Australia brings up images of exotic landscapes and vast tracts of wilderness. It was originally inhabited by Aborigines tens of thousands of years ago and, much later, by Europeans as a penal colony. Australia has brought us colorful characters like Crocodile Dundee (I’m dating myself by that reference) and Steve Irwin. The dialect of English spoken there is charming and immediately recognizable. This land is a modern tourist destination for those among us who want to experience the culture of Sydney and the adventures of the Outback. But who would’ve thought that one of the first bands of tourists were ancient Egyptians, thousands of years ago? Few would imagine that the builders of the Great Pyramid and the founders of the world’s first nation-state would also sail the wide-open seas and find themselves Down Under. What do the glyphs tell us? What story lay hidden in the ancient script? Thus speaks his Highness the Prince from this wretched place within this land, transported there by ship. Doing this writing for the Crown of Lower Egypt, according to God’s Words. The fellaheen call out from this place in this strange land, for Suti. The snake bit twice, all those behind the divine Lord of Khufu, the Lord of the two Adzes , mighty one of LOWER EGYPT. Not all go back. (we are) marching forward, (we) do not look back. A hard road, we all wept over the body, keeping to that, which is allowed. “Seated (by) the Side way.” “With concern and deep love, (the) Fellaheen. Plants wilting, Land dying, is this my lot from the most high God, of the sacred Mer. The Sun pours down upon (my back), O! Khepera, most High, this is not as the Oracle said. My Obelisk is overturned, but not broken. The bandaged one is confined, Hear, The Red Earth Region.” Then of Time to grow, (i.e. Spring), We walled in with local Stones the entrance to the side chamber. I counted and impounded the daggers (of the) Fellaheen. The three doors to Eternity are connected to the rear end behind the bulwark (of the Grave). A Necklace placed by his side. A Royal Token, signifying Heavens Gift, as from thou…! O Holy Shining Ones. Taken across (to) private sanctuary (of this) Tomb. (Along with) the Silver Dagger, a Royal Token (of the) Great Maker. Separated from (the city of) “ PENU” (is) the Royal Body (and from) all others. That Regal Person that came from the House of God, Nefer-ti-ru, the Son of Khufu, King of Upper and Lower Egypt , who died before, is laid to rest. He is not of this place. His home is Penu. Return him to his town . One third of (the) fruits, I myself divided for the burial service. Hold his Spirit with love, O most High. Worms in the basket of fruit, going into (him), shall not be. May he have Life, everlasting. Am I not to go back besides the Waters of the Sacred Mer, Then clasp him, my Brother’s Spirit to thy side, O Father of the Earth. There you have it. We have two princes, Nefer-Djeseb and Nefer-Ti-Ru, sons of the great king Khufu, leading a band of Egyptian sailers to far-off Australia. Their ship ran aground, and evidently Prince Nefer-Ti-Ru succumbed to a snake bite. He was interred there, in the rocky outcrops near modern Gosford, 4,500 years ago. We know the timeline because of the clear mention of Khufu, builder of the Great Pyramid, one of the mightiest edifices of pharaonic Egypt. Khufu reigned around 2547-2524 BCE, the second king of Dynasty 4, early in the Old Kingdom. His father was Sneferu (2597-2547 BCE), builder of three large masonry pyramids. So, we know the backstory, we know the timeline, we know the main players. We can see the hieroglyphs for ourselves, splashed over those sandstone rock faces. The inscriptions are most commonly referred to as the Gosford Glyphs due to the nearby community of Gosford. They’re also known as the Kariong Glyphs because they’re located in the Brisbaine Water National Park, Kariong, which is a wilderness area governed by Australia’s National Parks and Wildlife Service. But are the inscriptions real? Did a hardy band of Egyptian sailors really set out from Early Bronze Age Egypt and ply the open waters of the ocean for thousands of miles to travel to Australia? Logic and reason would tell you, no. Logic and reason would be correct, of course. This is absurd on the face of it. Nevertheless, the Gosford hoax has a zealously loyal band of believers, most of whom seem to be a number of Australians who passionately build on the hoax to deliver it to us as authentic. Whether some or most of these Australian believers had anything to do with the creation of the hoax is not clear, and it’s not even clear if they honestly believe in it themselves, but goodness, do they rise up in defense of it! So in honor of the Gosford Glyphs I’m writing this article to explain and demonstrate in no uncertain terms why they’re so obviously a fraud. If nothing else, my humble article will be one more voice of reason out there on the Net. There is too much material to cover in one segment, so I intend to break it up into more than one entry. To begin, let’s introduce a couple of the modern players who defend the Gosford Glyphs. The above translation was concocted by an Australian named Ray Johnson, who passed away some years ago. You will see on any number of web pages mentioning that Mr. Johnson was an Egyptologist. This is not accurate. By the statements Johnson made and by the things he wrote, it is abundantly clear that Johnson did not possess much understanding of pharaonic Egypt and definitely did not understand the protocols and techniques necessary to translate hieroglyphs. You will see any number of people who promote the Gosford Glyphs proclaiming themselves to be archaeologists and/or Egyptologists, when it’s clear none of these people possess any credentials in those fields. You’ll also notice they love attaching “Ph.D.” to their names. While I’ve spent years studying Egyptian hieroglyphs myself, and have worked hard on my ability to conduct translations, I have no problem stating outright that I am neither an archaeologist nor an Egyptologist. Honesty is critical in historical studies and research, so few things push my buttons like folks who enjoy pretending to be things they are not. Some of the characters in this Gosford drama have written documents you can find and download on the internet. They’re in this format, of course, because no publisher would dare to touch them. I am not interested in promoting their work or linking you to their “papers,” so I leave it to you to hunt them down, if you wish to. Ray Johnson is obviously something of a cult hero to these fringies. They proudly refer to him as an Australian Egyptologist and intimate that Johnson performed cutting-edge linguistic research at the Gosford site. As laughable as the whole thing is, admittedly I’ve taken the time to download and read their papers. There is immediate confusion with the name Ray Johnson, and to me this is troublesome. Many people familiar with the field of Egyptology will probably have encountered an Egyptologist named Ray Johnson. Indeed there is one. Dr. Ray Johnson is from the University of Chicago, Oriental Institute, and is the director of the Chicago House in Luxor, Egypt. Dr. Johnson is a leader in the field of Egyptian epigraphy. It must be stressed that the Australian Ray Johnson and the University of Chicago Ray Johnson are two different men. Do the acolytes of the Australian Johnson make this clear? One would think so, especially given the fact that the Australian Johnson is deceased and the University of Chicago Johnson is still very much with us (he was one of the speakers around five years ago at the Oriental Institute when I was training to be a docent there). But it’s not always that clear, in fact. One of those papers you can download from the internet is called “Burial Site of Lord Nefer-Ti-Ru,” by an individual called Dr. R.M. de Jonge. The manner in which de Jonge provides citations and references is very loose and free, and at least two different references definitely refer to the University of Chicago Ray Johnson in a manner that seems to imply he was involved with the study of the Gosford Glyphs. I can’t outright state that de Jonge is trying to pull a trick on us because it might be nothing more than a case of an individual not knowing how to cite properly. 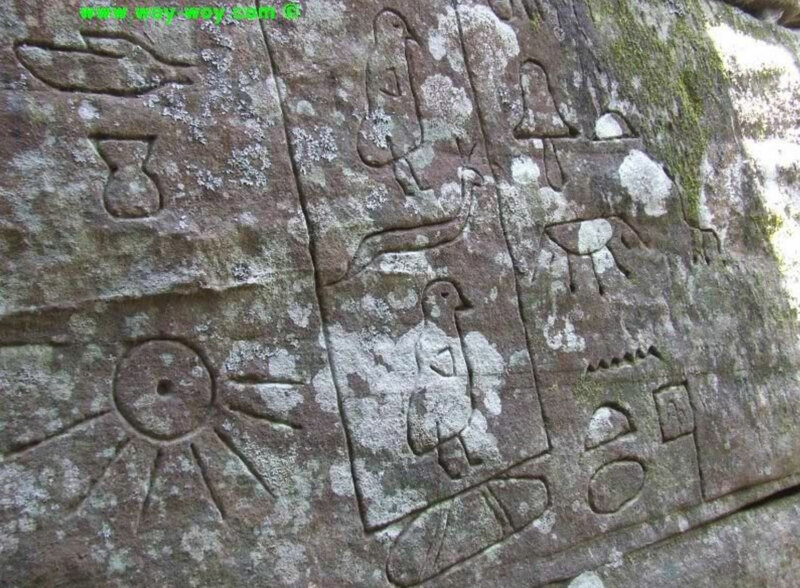 I recognise these photographs as being from an Australian rock depiction which supposedly has evidence of Ancient Egyptian hieroglyphs. I believe that the inscription is a modern forgery, and not a good one at that. I bother to share the words of these three Egyptologists because one of the claims of the fringies who so ardently support the Gosford Glyphs is that they’ve never received attention from academia and that all counterarguments are sloppy and incorrect. In other words, they present their own work as infallible while all negative comments are inherently flawed. As arrogant and unrealistic as this is, it is a common tactic of fringe adherents. Incidentally, another big promoter of Gosford is an Australian named Rex Gilroy. He has his own website. I’m sure pretty much everyone living in Australia must know of Rex Gilroy, and no doubt many fringies enjoy his work. Gilroy argues that not only Egyptians but Phoenicians were ancient visitors to his land. Then again, Mr. Gilroy also argues in favor of UFOs and the Australian version of Bigfoot (Yowie), so I don’t know how credible he is to begin with. I’ll bet he’s a hell of a story teller, however. In my next installment I’ll break down the specifics of the Gosford Glyphs: when they actually date to, the nature of the hieroglyphs, the story the Australian Ray Johnson concocted, and how we know for certain all of this is just a tremendous load of bull-flop. On a closing note, the photos I’m sharing in the Gosford articles are used with the permission of Steve S., author of a terrific Australian blog named All things Woy (LINK). More than probably anyone Steve has documented the Gosford phenomenon, its origins, its development, and its investigations. I’m indebted to Steve and highly recommend his blog.